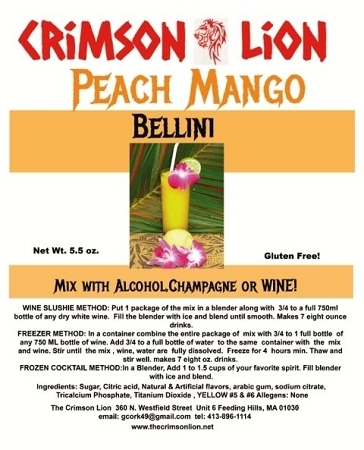 * Peach Mango Cocktail Slushie: This is also a fantastic tasting drink when mixed with 1 package of the mix, with 3/4 bottle of white wine such as Chardonnay or Pinot Grigio, Fill blender with ice. Can substitute dry Champagne in lieu of wine. We also enjoy with spirits such as Vodka or Rum. 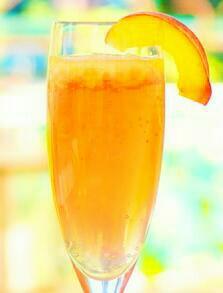 For a delicious brunch cocktail make a scrumptious Peach-Mango Mimosa Cocktail. One package of the mix, 2 cups Champagne or dry white wine ( can use 1 cup each) 2 cups orange juice. Mix well and garnish with mint leaves.